What is the Yellowstone supervolcano? Use our super resource (including downloadable maps, videos, and photos) to learn more. No worries, no lava. Those gorgeous arabesques are mineral deposits surrounding Yellowstone’s Grand Prismatic Spring. The geologic feature beneath Yellowstone National Park is described as a “supervolcano.” How does a supervolcano differ from a regular volcano? A supervolcano is just what it sounds like—a really, really powerful volcano. “Supervolcano” can describe the volcano itself (like Yellowstone), a singular volcanic eruption (sometimes called a “supereruption”), or a long-lasting (million-year!) series of eruptions and lava flows. Supervolcanoes form as magma in the Earth’s mantle rises to the crust but is unable to break through it. A massive magma chamber develops (take a look at the Yellowstone magma plume here) until the chamber can no longer contain the enormous pressure and violently erupts. Learn more about magma and magma chambers with our resource here. Where are the world’s supervolcanoes? subduction zone. La Pacana, part of the Central Volcanic Zone of the Andes, is a supervolcano formed as the Nazca plate subducts beneath the South American plate. hot spot. 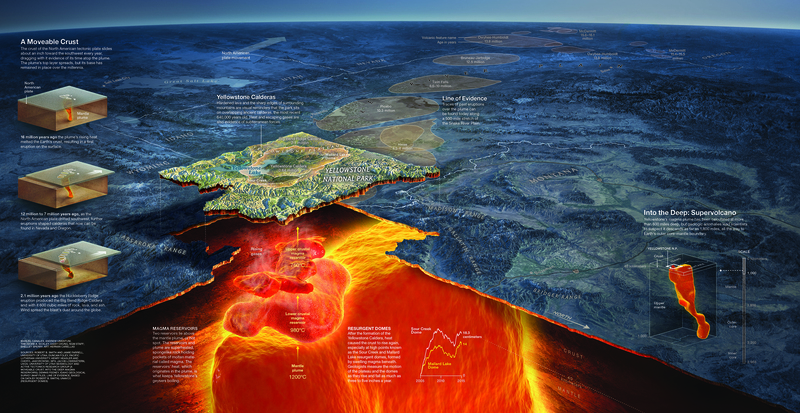 The Yellowstone supervolcano sits over the Yellowstone hot spot. The Yellowstone hot spot has remained stable for millions of years, while the North American continent has drifted southwest. large igneous province. The volcanic event that produced the “Siberian Traps” in northern Russia lasted more than a million years and is sometimes associated with the Permian-Triassic extinction event, in which 96% of marine species and 70% of terrestrial species were wiped out. Volcanologists estimate supereruptions happen about every 100,000 years. When was the last time the world experienced the eruption of a supervolcano? About 26,500 years ago, the Oruanui eruption sent about 1,170 cubic kilometers (281 cubic miles) of ejecta into the atmosphere. CLICK TO ENLARGE! 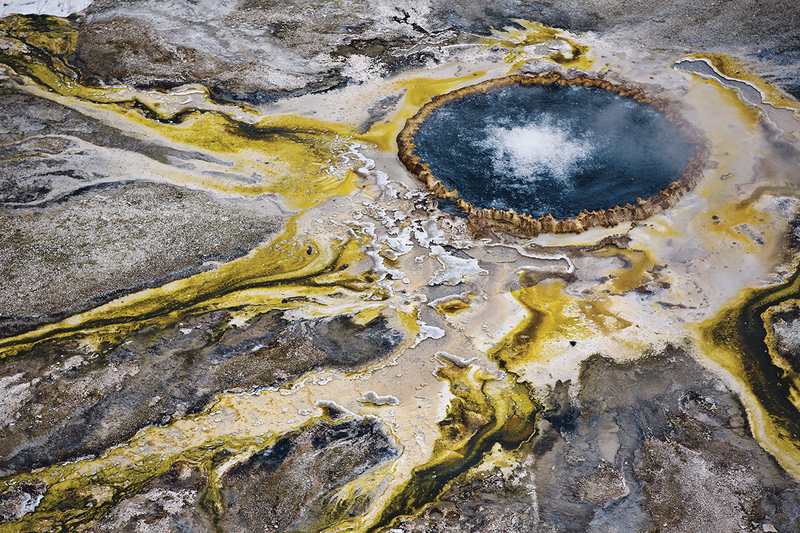 The gargantuan, superheated plume of rock under Yellowstone fuels the Earth’s largest collection of hydrothermal features. Why do volcanologists and other scientists think the Yellowstone supervolcano may erupt sooner than we thought? CLICK TO ENLARGE! 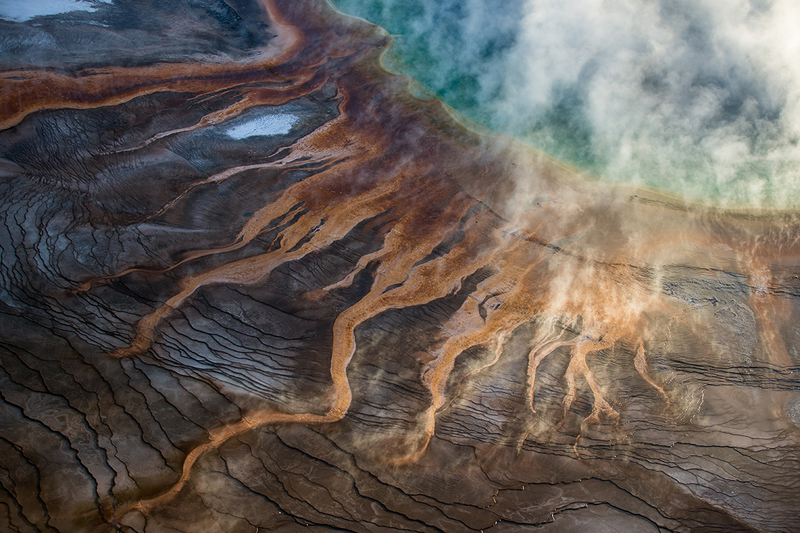 The distinctive shape of Yellowstone’s magma chamber and its pattern of eruptions over millions of years are due to the geology of the Yellowstone hot spot. The hot spot, forming deep within Earth’s mantle, remains relatively stable while the North American continent shifts slowly to the southwest. 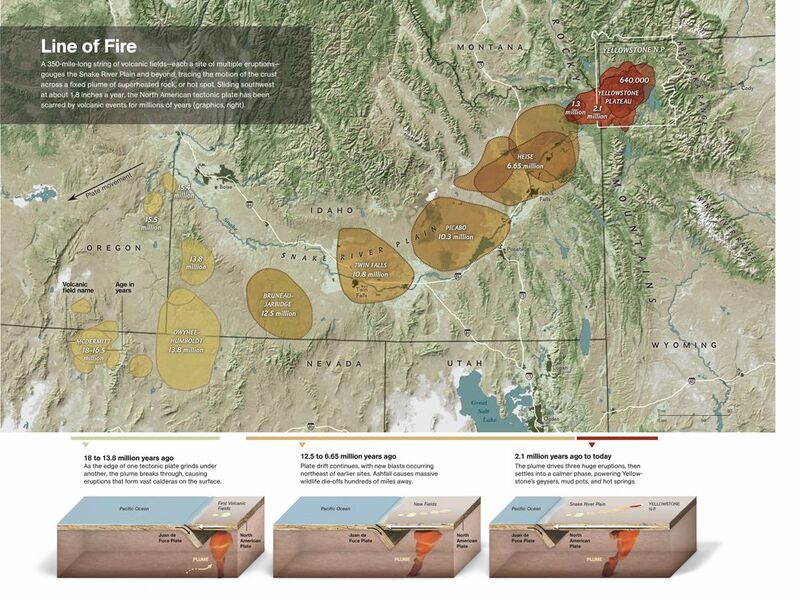 When was the last time the Yellowstone supervolcano erupted? Read through our great, student-friendly article for some help. 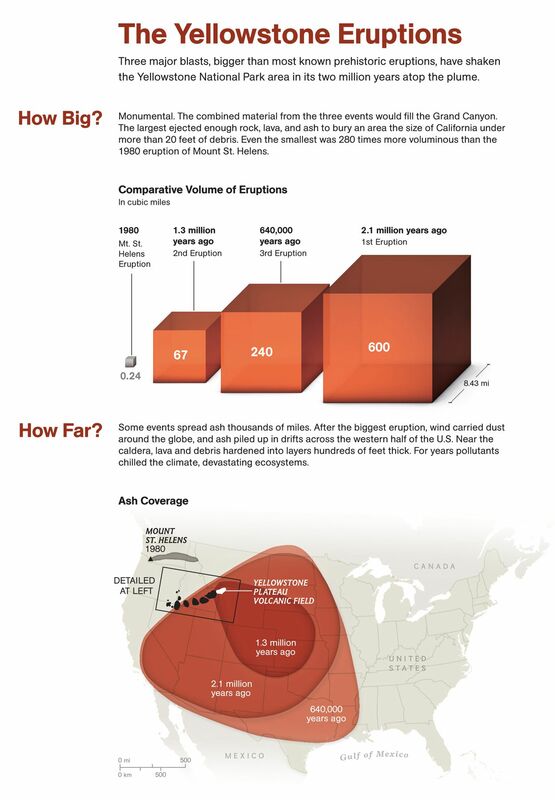 According to our article, Yellowstone has produced three colossal eruptions within the past 2.1 million years. The last eruption occurred about 70,000 years ago. Yellowstone has endured three major eruptions within the past two million years. Volcanic debris from these eruptions has been discovered as far south as Louisiana and as far west as California. Previous eruptions at Yellowstone spewed tons of volcanic debris that covered most of the continental U.S. Should we be worried about the new research predicting a possible earlier eruption? Not yet. Yellowstone is still considered dormant, and is one of the best-monitored volcanoes in the world. Sensors and satellites are constantly looking for changes in Yellowstone’s geology, and right now, the supervolcano does not seem to pose a threat. Learn more about how the Yellowstone Volcano Observatory is keeping track of its “sleeping giant” with our video series here, here, and here. The weird geologic features of Yellowstone are influenced by a big column of super-heated rock—the supervolcano’s magma plume. Geologic features influenced by the supervolcano include vents, mud pots, mineral pools, hot springs, and geysers like Steep Cone Geyser here. Nat Geo: What is a hot spot? 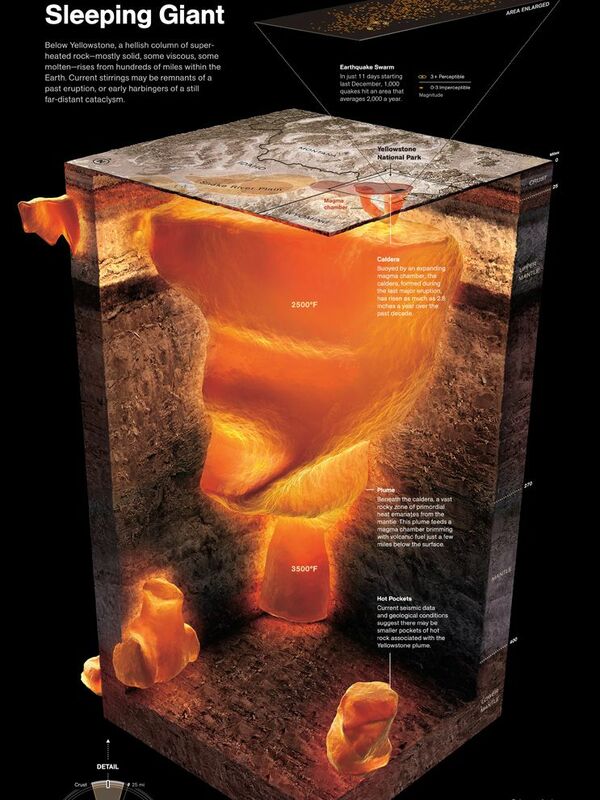 Nat Geo: What is a volcano? Reading this article, I realized it can become a serious problem. We are pumping 19 million gallons of waster water into the Geysers for the Geothermal More than 350 steam production wells have been drilled within The Geysers region to tap natural steam. Some of these wells are as deep as three kilometres.